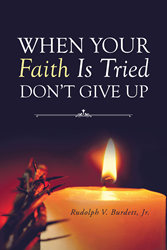 “When Your Faith Is Tried Don't Give Up” from Christian Faith Publishing author Rudolph V. Burdett, Jr. was written to provide reassurance to those who want to give up on their Faith. By offering relevant and mandatory stories for modern times, the author has shown that even the most important characters of the Bible have had their faith tested. “When Your Faith Is Tried Don't Give Up”: a Biblical study guide that offers inspiration to those who want to give up on their Faith. “When Your Faith Is Tried Don't Give Up” is the creation of published author, Rudolph V. Burdett, Jr., teacher, author, ordained ministering evangelist, influential leader, and inspirational figure. The Lord allowed Rudolph V. Burdett to work in North Carolina where served at the Church of Christ as his congregation’s first senior minister from 2002 to 2007. Rudolph is the Director of the Food, Education, and Distribution Center (FEDC), which was established in 2004. He has been married to Tavondia Williams Burdett for nineteen years. He relates to people from every walk in life by teaching and preaching faith, which is the gospel of Jesus Christ. “I don’t care who you are or what difficulties you have in your life, you are blessed. You are not a mistake. As my wife always says, ’God sees the whole picture.’ Things happen for a reason.” --Rudolph V. Burdett, Jr. Published by Christian Faith Publishing, Rudolph V. Burdett, Jr.’s new book is a study guide that offers encouragement to Christians in doubt. “When Your Faith Is Tried Don't Give Up” is designed to encourage Christians who want to give up their Faith in God when they are tested. Unfortunately, bad things happen that can try the Faith of even the most devoted Christians. Some people will throw their hands up, surrender to the forces of the world, and go about their Earthly lives. It is easy to give up on one’s Faith, but doing so offers nothing but pain. View a synopsis of “When Your Faith Is Tried Don't Give Up” on YouTube. Consumers can purchase “When Your Faith Is Tried Don't Give Up” at traditional brick & mortar bookstores, or online at Amazon.com, Apple iTunes store, Kobo or Barnes and Noble. For additional information or inquiries about “When Your Faith Is Tried Don't Give Up”, contact the Christian Faith Publishing media department at 866-554-0919.